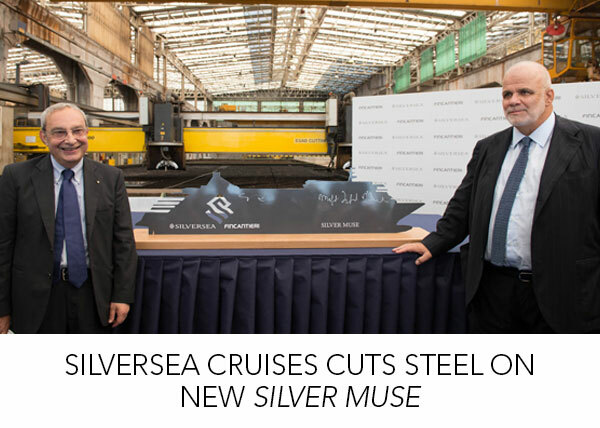 Silversea Cruises celebrated the start of construction of Silver Muse on July 24 with the cutting of first steel at Fincantieri's Sestri Ponente shipyard in Genoa, Italy. Silversea’s chairman Manfredi Lefebvre d'Ovidio co-hosted the event with Giuseppe Bono, CEO of Fincantieri. Set to debut in the spring of 2017, Silversea’s new flagship will maintain the line's commitment to operating the highest quality ships in the ultra-luxury segment. The steel cutting for Silver Muse follows extensive planning and development of new concepts to enhance the onboard experience. “We're very pleased to once again partner with Silversea” commented Bono. “Silversea has shown remarkable dynamism and ability to achieve important results in this market. This project offers us the opportunity to develop creative solutions and set new standards for shipbuilding in the ultra-luxury segment”. “The start of construction of Silver Muse is a very proud occasion for us and I am delighted to be back at Fincantieri to celebrate this milestone", said Lefebvre d'Ovidio. “The concept of this ship descends from our vision of luxury, that is a very personal element for a guest, and that’s why Silversea has always offered a tailored cruise experience, shaped around the preferences of each different person. Silver Muse will make a further step ahead in this direction, offering our guests a simply-divine experience. Silver Muse will be an intimate ship, with just the right proportions: the only one with 40,700 grt and less than 300 suites to be launched in the ultra-luxury segment in the coming years. It will provide our guests with an outstanding dining experience, offering the highest number of restaurants than any other vessel in the category, while ensuring the same, unparalleled level of service we are famous for. And, of course, Silver Muse will bring the world to our guests, featuring new, carefully curated itineraries that will allow them to visit the most exceptional destinations in the utmost elegance at sea”.